Recently a unique construction process called decentering that is releasing temporary auxiliary facilities has been finished on a Russian stadium. 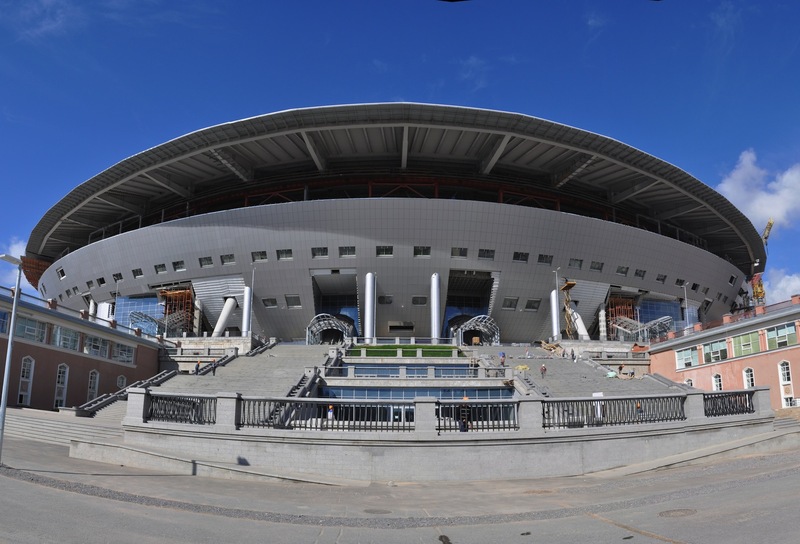 The roof «floating» over the stadium bowl is one of the key concept points of the project. To carry out this bold architectural idea a number of unique and technically complicated decisions required the principal of which is the system of cables and pillars. The roof with the weight about 23 thousand ton and area more than 71 thousand sq. m. is supported by 40 cables spanned over 8 piers and 56 gantry pillars installed on the peak point of the stadium bowl. For the additional safety of the roof structure under the girders another 4 ferroconcrete piers have been installed. Each cable in its turn consists of 72-110 steel wire strands 30 to 40 meter long. A wire strand consists of seven galvanized wires with a mandrel protected with a lubricant and additionally covered with plastic. The total length of all wire strands is about 100 km. The combination of the 2 carrying systems, cables and pillars, allows maintaining the steadiness of structures under different snow and wind loads and by temperature variations. The decentering process including the preparatory stage, cable system formation, took about 3 months. Cable formation and spanning were carried out strictly in accordance with the confirmed regulations. In the decentering process itself 56 lifting jacks each 300 ton were involved. The process was carried out by 70 high qualified assemblers and 20 engineers. The installation was accompanied by construction monitoring which didn’t show any deviation from standard indicators. In the stadium roof construction there were used technologies that are usually used in bridge construction. Such technological cycles (stock adjustment, sliding, cable system arrangement, resupporting) are meant for the construction of cable-stayed bridges both existing and planned in St. Petersburg. The stadium in St. Petersburg will be the only one in Russia and among the few stadiums in the world equipped with a retractable roof. It will allow stadium to be used all year round both as a sports arena and as a concert and exhibition space. The temperature inside the arena will not be lower than +7°С regardless of the weather. To create such conditions apart from the roof the stadium with the great bowl of 5 million cub. m will be equipped with all-powerful utilities. At the moment most of the general utilities, finishing coat and arena stained glass windows are already installed. Tier furnishing and chair placement, installation of elevators, escalators, utilities and roll-out field machinery, primary access control zone outfitting and stadium infrastructure development are in the active phase. Main construction works on the site are supposed to be finished by the end of the year; whole construction will be completed by the end of 2016.